Explanation: It looks like a double comet, but Comet PanSTARRS (C/2011 L4) is just offering skygazers a Messier moment. Outward bound and fading in this starry scene, the well-photographed comet is remarkably similar in brightness to M31, the Andromeda Galaxy. Tracking through northern skies just below the galaxy, the comet was captured as local midnight approached on April 3. 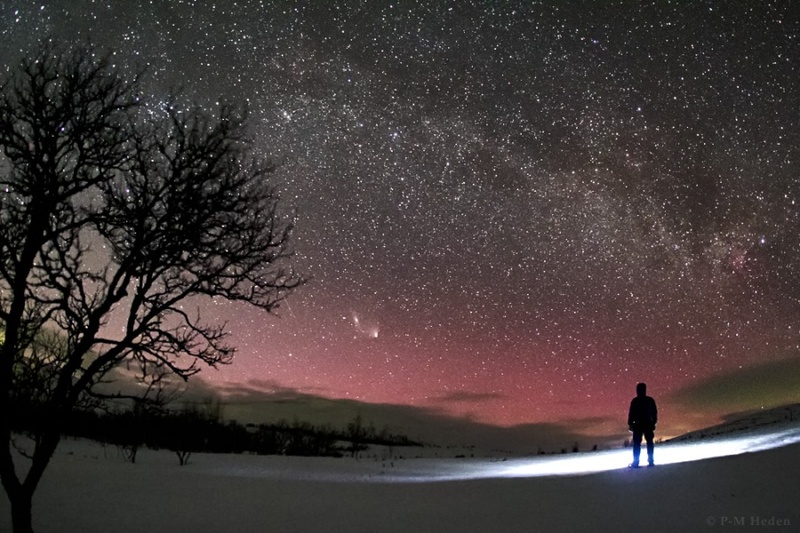 Both comet and galaxy were visible to the eye and are immersed in the faint glow of northern lights. Our own Milky Way galaxy arcs over the snowy field near Tänndalen, Sweden. Double star cluster h and chi Persei can be spotted along the Milky Way's arc high above the comet/galaxy pair. Follow the arc to bright Deneb, alpha star of the constellation Cygnus, at the right edge of the frame.